...to all Christians of any Church or none, who want to find or to worship God using the English language. Your visit may be a virtual one on this website, or actual when you come to our adopted city. We hope you will find, as many do, that St. George's provides a Christian experience in a familiar Anglican / Episcopalian setting, but one in keeping with our cultural surroundings. Here you can offer your thanks to the Creator in the midst of the glories of the art and architecture of the city, and reflect on how they might affect you in your own life. Your first point of reference is the famous art gallery Accademia di Belli Arti and its waterbus stop "Accademia". The regular waterbus ("vaporetto") numbers to catch are 1 or 2 to Accademia.from both directions on the Grand Canal. If you are staying in the St. Mark's area, it's not very far on foot (20 minutes from St.Mark's Square); just head for Accademia and cross the wooden bridge over the Grand Canal. 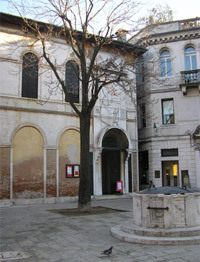 At the foot of the bridge at Accademia, keep to the left, skirting the large Gallery building and then take the second alley turning on the left: Calle Nuova St. Agnese. There is a sign up above the glass shop on the corner To St. George's Church. After 100 yards, cross the bridge, which leads straight into Campo San Vio, with St George's handsome bronze doors opposite and just to the left. If you are coming from either Piazzale Roma or from the Giardini / Arsenale / San Zacharia areas or Lido take the vaporetto 5.1. or 5.2. to Zattere. If from the Giudecca, boat number 2 to Zattere. From Zattere boat stop turn right and then almost immediately left by the side of the Church of Santa Maria della Rosario (Gesuati) Walk straight ahead for 400 yards and take Calle Nuova (as above) but which from this direction is on your right. Then follow the same directions as in the paragraph above.